This is the included booklet that we received which tells us our theme which is Insect Explorer. The first page included a table of contents as well as an introduction to the topic and some fun facts about insects. Inside the booklet were several fun pages including a maze, a diagram of insect anatomy and some creative ideas for collecting fireflies and making egg carton bugs. It also included a recipe for a ladybug strawberry, a fun way to repurpose your box, some bug-themed book recommendations and their social media information on the back. The next item is a sticker chart for us to collect our Green Kid Crafts badges. This month we received the Entomology Expert badge. We can also color in our chart to personalize it and continue to add badges to it. The first kit focused on backyard bug science and they sent us a few bugs to get us started! They included some eraser bees and ladybugs, some wooden ladybugs, and a few plastic bugs. My son was incredibly excited to see all these little creatures to play with! The first activity was to decorate our bug magnifying jar. This plastic jar is topped with a lid that has holes in it and a magnifying section on top so that we can go out and collect bugs and get a nice close-up view! We decorated the outside of our jar with the wooden ladybugs since they had adhesive on the back. Then we used the various bugs we received and put them inside the jar to get a closer look. The second activity is to do a bug scavenger hunt to find some everyday insects like flies, ants, and grasshoppers. Since our yard is currently being covered in snow, it might be a while before we get to do this one, but I love that we have our own little magnifying cup to catch some critters in this spring. They also included some fun facts about these familiar insects. The last activity was to play tic tac toe using our new bug erasers and the inside of our box. Since we already had the paper out from making our insect art, I just drew us a board on one of the papers and my daughter and I played a few rounds while my son was occupied playing with the other little bugs. 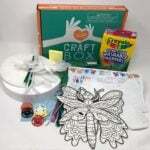 The next kit included some items to make insect art. They provided a min lantern and some tiny wooden bees with adhesive on the back to create our own beehive with. They also included some interesting facts about bees, some of which I didn’t know! They provided information on how we can support bees by planting the type of flowers they use for food. First, I put together our mini lantern by inserting the metal wire frame into the center to expand it. Then my daughter cut out a little circle for the center of the beehive and we glued it on. Then my daughter decorated it by adding the little bees with adhesive on the back of them. Finally, I tied a piece of yarn to the top and it was complete! This was such a cute and easy way to learn about bees and make our own beehive to hang up for decoration. The next insect art activity was to use the two sets of WikkiStix they provided to create some 2D insects on paper. We love playing with WikkiStix so this was a fun challenge for us that we enjoyed. Next, we tried making some 3D insects with our WikkiStix which was a little bit trickier! They also suggested making some yarn-wrapped bugs as a third project using some yarn, pipe cleaners, and cardboard from our box. We didn’t get a chance to get to that one just yet since it required a few extra materials from home, but it will be a fun activity for a rainy day! The last kit involved making some busy butterflies a few different ways. First up was to make a chromatography butterfly using the mini markers they provided and these giant coffee filters. We have actually done this project before, but with smaller coffee filters. This large size definitely made it more fun! We began by making circles in the center of our coffee filters and then working outward. Since I was somewhat familiar with this project I didn’t read the instructions as thoroughly as I should have and we sort of took some creative license in our designs! The directions wanted us to keep our colors separate and keep track of which ones we used so that we could see how each colored marker was made up of different colors. They related this to how chromatography is used at a crime scene to determine which pen might have been used to write a note. I thought it was a cool fact, but we were still able to observe the colors spreading without completely following the directions! My daughter was just having fun adding colors and designs to her coffee filter! Once they were done, I folded them into a cone shape like this. Then we placed them in cups of water with just the tips in the water and observed how the water spread up the filter and spread out our marker colors. The kids enjoyed watching to see the “magic” that was happening! After a few minutes, we took them out and set them out to dry overnight. When our filters were dry the next day, we used our pipe cleaners to twist around the center to form our butterflies. They turned out pretty nicely and we all loved how nice and big they were! Fortunately, while we waited for those to dry we had one last activity to do. We were able to repurpose our kit bags to create some butterflies by filling them with items from around the house. They suggested using snacks, buttons or glitter. Since it was almost bedtime, I didn’t want to break out the snacks so I opted for some pom poms for mine. I filled the bag halfway and then added a pipe cleaner in the center and then finished filling it up before resealing it with the adhesive which was still plenty sticky from when I had opened it. I was running out of pom poms, so my son ended up with some sponge pieces (we use them as soft blocks) and my daughter came up with her own idea to put the markers into her bag. I did my best to turn them into butterflies by distributing the materials evenly between the two sides and tying the pipe cleaners as tight as I could. It was good enough for them because they proceeded to fly their butterflies around the house until bedtime! Verdict: I liked our Green Kid Crafts box this month and I think the theme of insects was definitely one that appealed to my kids (ages 2 & 4). The activities were all fairly simple and fun ways to explore insects and definitely age appropriate. The box contained almost all of the materials we needed and it was well organized. I appreciate their mission of bringing STEAM projects to children with a goal towards sustainability through the materials and packaging that they use and that they found a way for us to repurpose so many of our packing materials this month. I feel like I would have liked to see one more activity or maybe for some materials to be included for us to complete the yarn insect art to really make this box feel complete. For $25.90 ($19.95 + $5.95 shipping) we had a great experience learning about bugs, making them and especially playing with them!